This shuttle operates Monday-Friday only. All times are approximate. Arrive 5+ minutes early. Evening stops marked with an asterisk (*) are on-demand; contact us by 4:00 P.M. to request pickup. For an accessible (lift-equipped) bus, contact us 24+ hours in advance. 1. Only riders who are affiliated with a 128 Business Council member company (either because the member company is the rider’s employer or because the rider’s employer is a tenant of a member company) are eligible to ride on a member fare (in this case, fare-free). If you are not sure whether you qualify for member rates, please contact us. 2. In order to ride fare-free, you need a valid 128 Business Council Shuttle ID card, which you can obtain from your company or community transportation coordinator. If you don’t know who your transportation coordinator is, or if you need help obtaining your card, please contact us. 2. Your 10-ride shuttle ticket(s) will be mailed to your confirmed address within the United States, as shown by PayPal (usually the same as your billing address). If you need to ship to an address different than the one shown, please contact us. 3. Purchased tickets should arrive within 5-7 business days. If your tickets do not arrive within 7 business days, please email us at 128bc@128bc.org and include your PayPal confirmation number. All of the stops currently served by Needham Shuttle are shown in dark green below. All other stops served by 128BC are shown in light green. Need to make an accessible trip? Contact us at least 24 hours in advance so that we can ensure that one of our accessible (lift-equipped) vehicles is available for your trip. Individuals with paratransit needs in the Metro-Boston area may be eligible to use THE RIDE, a door-to-door, shared-ride transportation service operated by the MBTA for those who cannot use fixed-route transit due to physical, mental, or cognitive disability. 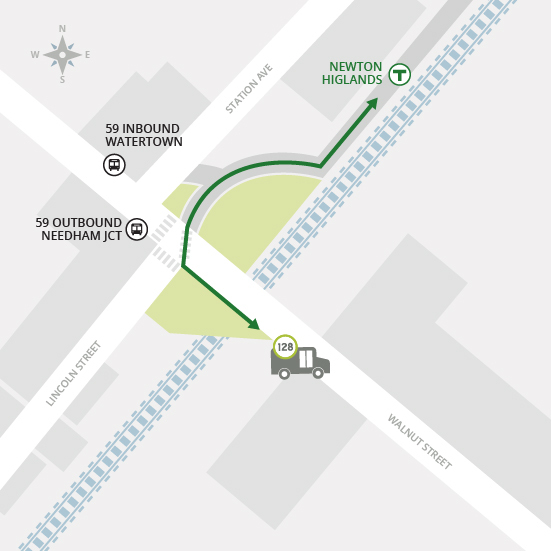 Please visit the MBTA Accessibility site for more details regarding the MBTA’s accessibility guides and services. If you require paratransit services beyond the service region of THE RIDE, please visit the Massachusetts Executive Office of Health and Human Services (EOHHS) site for more details regarding providers throughout the state. 128 Business Council abides by Title VI of the Civil Rights Act of 1964, which prohibits discrimination based upon race, color or national origin. To read more about our Title VI nondiscrimination policy or to file a complaint regarding an alleged violation of nondiscrimination obligations, click here. Any such complaint should be made in writing and filed with 128 Business Council’s Title VI Program Manager within 180 days of the date of the occurrence. You are also welcome to contact us directly if you have questions about our policies or would like to discuss an occurrence. Please ask for our Title VI Program Manager.